Lotus Notes to Outlook Conversion Tool! Migrate Quickly from Lotus Notes to Outlook with Export Notes! Lotus Notes involves high installation costs annually, that many organizations fails to afford every year. Users have to switch from Lotus to Outlook because of change of job or profession. Each email systems maintain their own formatting to store emails, contacts, journals, calendars etc. Thus migration of Lotus to Outlook becomes difficult and frustrating. At this situation, Export Notes is the BEST SOLUTION! 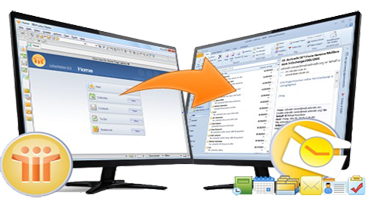 Our Software is the best solution to convert Lotus to Outlook to quickly perform transition from Lotus Notes e-mail to MS Outlook email system. Software is a powerful Lotus Notes migration utility to convert nsf files of Lotus Notes clients & Lotus Notes Domino Server to Outlook PST file. Software efficiently migrates Lotus Notes Domino Server mailboxes to Outlook provided your Domino Server is not running or Domino Server is shutdown. Lotus to Outlook Conversion tool help users to get away from this situation and easily convert all the meta data of Lotus Notes to MS Outlook. Export Notes is a powerful Lotus to Outlook migration utility to convert nsf files of Lotus Notes Clients & Lotus Notes Domino Server to Outlook PST file. Software efficiently migrates Lotus Notes Domino Server mailboxes to Outlook provided your Domino Server is not running or Domino Server is shutdown. Conversion of Lotus Notes emails to MS Outlook emails has been made very easy with Notes to Outlook Migration Tool which performs successfully transition of Lotus Notes to MS Outlook. Key Features of Migrate Lotus Notes to Outlook! Mails, Calendars, Contacts, Tasks, and Journals, all these options are available in a horizontal list along with check option. You can check all the options if they want all these type of elements to be exported from NSF files to PST. Or selection can be made according to personal choice. The option to exclude email filters while NSF data export is running further adds up privileges to eliminate unsought emails. For the same, Exclude Folders, Exclude Deleted Items and Exclude Sent Items checkboxes are available. With the date range option you can restrict NSF emails for the given interval to be exported into PST. All the emails excluding the time rage will get exported into NSF file with same properties. For skipping the undesired To-do and calendar entries during NSF to PST data conversion, you can opt Calendar Filter and To-do filter that restrict to export calendar and to-do entries for the entered time interval. when my close friend have told me about the Export Notes that it can remove encryption from lotus notes mail it's unbelievable for me. After running its trial version I am surprised & purchase its full version.Its really a stunning product. I was seeking for device that have the facility to exclude undesirable folders as I Didn’t want a bulk migration of adverse data to Outlook. Filter property of NSF PST Software eradicates all my problems in once.